I cannot tell you how much I LOVED this album as a kid in the late 70’s! I wasn’t really a big fan of Star Wars but somehow I ended up with this and it received endless rotation on the Rogers family phonograph. One time I was watching the David Letterman Show and they had a sub bass player filling in for Will Lee. His name was Neil Jason. 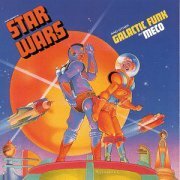 I read his bio online and it turns out he played bass on the Star Wars And Other Galactic Funk album! Living in the internet age, I found him on Facebook and wrote a little note telling him how much I loved it back in the day. He was kind enough to write back. What a world we live in! Previous PostPrevious Banning Bagpipes & Bongos?